Hermes have just created a $2 million bag, redefining luxury handbags (which they seem to do quite well for as long as I can remember), adding four of the Kelly style bags in solid gold. 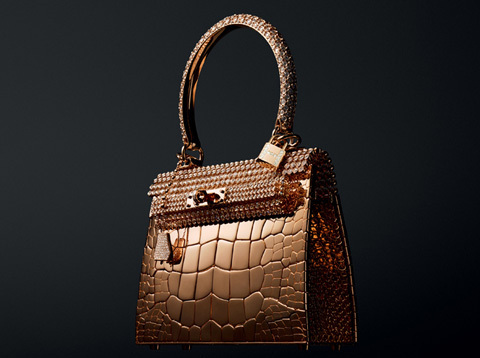 Pierre Hardy, jeweller and shoemaker, helped the French brand create the bags which are adorned with 1,600 diamonds. Whoever buys this bag (whoever you are, I hope one day I get to meet you, you crazy!) will need at least 3 entourages of big men with them at all times when carrying this bag. Or will it be purchased, not for practical reasons, but as an art piece to place on your decadent table in your multi-million dollar apartment to show off to guests? I don't know because sadly I simply don't have $2 million.